The Prometheus trailers piqued my interest as the storyline itself is centered around the scientific quest of mankind to explain the how and why of our existence. I have to admit that I went to the theater with low expectations but was pleasantly surprised. Directed by Ridley Scott the film is a visually stunning treat although the muddled story line left me slightly disappointed. There is definitely several philosophical bright points in the movie that were unexpected. One was the admission from the writer and producer that the complexity of the relationship between DNA and RNA cannot be easily explained by Neo-Darwinism. Not that Ridley Scott went as far as advocating any type of spirituality but he is definitely proposing that there may be another explanation for creation other than complete randomness. Ridley Scott even acknowledges the problem of the theory of a more advanced civilization designing or creating the human race as one of the characters ask, "And who created the engineers?". In these respects the film is to be celebrated as it acknowledges the difficulties of the present theories of creation and even in some degree flat out challenges them. The movie itself is classic Ridley Scott; starts out maddeningly slowly and doesn't just pick up speed at the end; it accelerates on jets. Some of the characters are hollow and the frustration of Charlize Theron in trying to play her character is nearly palatable. The special effects are top notch and Noomi Rapace is excellent as a scientist struggling with her faith and the apparent futility of our existence. Ridley Scott leaves the high probability of a second movie as more questions are left unanswered than answered. It will be interesting to see if he will lead us to more questions and possible answers while keeping the intellectually honesty that was refreshing in the first film or will he take us back to the same nihilistic droll that is so depressingly prevalent in the world view of current films. The Los Angeles Lakers have exited the Western Conference semi-finals in an unspectacular fashion for the second year in a row. In fact, in the last two series of the semi-finals they have won only one game. For a team that has won five championships in the last twelve years it is a bitter pill to swallow, particularly for one individual who many consider to be one of the best players ever to play the game. Kobe Bryant has made apparent his desire to continue to win championships but he is facing a dilemma that I believe is the same one the present Body of Christ in our Western culture is facing. Thanks to my wife the sports fanatic I have become an NBA sports aficionado. We watch more games than I care to admit and see several live every year. We have watched just about every Western Conference playoff game in the last fifteen years. I have watched Kobe Bryant play since his rookie year and there is no doubt that in the talent arena he is without a doubt something special. His ability to leap, make incredibly difficult shots on a consistent basis and to slither across the court like a black mamba is something to behold. Mix in intelligence, good looks and hard work and it is no wonder that he is a superstar. But these traits which have served him so well in the last decade are now working against him. One of the many downfalls humans have is the inability to recognize that the talents they possess that brought success can cause their downfall. Kobe has been able to rely on his abilities to consistently push his team over the hump in any game and give them the points to win. Entropy, that vicious and unrelenting force that is constantly breaking everything down catches up with all of us, Kings, Presidents and athletes without exceptions. Kobe is aging, and if he wants to win more championships he is not only going to need help, he may have to even take a less significant role as Tim Duncan has and reduce his minutes and bring in more talent on the bench and even among the starters. He may even have to bring in another superstar. Kobe Bryant is aging and as the Oklahoma City Thunder exposed he can no longer carry the team on his shoulders and the Lakers do not have the talent as a team to win another NBA Championship. The Western Church is facing the same dilemma. Since the Second Great Awakening the evangelical churches in North America and Europe have relied on great preachers and statesmen the likes of William Miller, Dwight Moody, Oral Roberts, and Billy Graham. Great men of God, charismatic and able to influence millions, they built the modern Church and helped many come to profess Jesus as their Lord and Savior. With technology came the media and with the media came the power for the present evangelical preachers to reach even more with the wonderful news of the Gospel. This last fifty years should have been a glorious rise of the Church in attendance and influence of the culture. Instead, we have seen exactly the opposite. The strength of the evangelical preacher became the downfall of the Body of Christ.They became the head of the Church, a position given to Jesus by God, instead of the shepherds they were called to be. Some even became wolves in sheep clothing. The fruit bore by the Church in the last fifty years has been less than palpable. Europe is for all purposes an entirely secular society. America is dragging itself in that direction. Over ninety percent of Americans say they believe in God but they also support abortion and in growing numbers homosexual marriage. The American people are deep in debt, divorced and raising children in a shockingly high number of fatherless homes. And where is the Church? With its bankruptcy and divorce rates at or exceeding the society it lives in the Church is right there with them. Instead of influencing society the Body of Christ is reflecting society. Why? When Kobe Bryant goes off in a game it is something to watch. Many times I've even seen his own teammates stand in awe as he performs circus acts. But that is their downfall. They should be moving and positioning themselves for offensive rebounds, not watching a superstar play basketball. The Church has a tendency to do the same thing. We are enthralled by the celebrities of the Church and forget that the Body of Christ is suppose to be in the game. In fact, if we read the Bible, it clearly states that our leadership is like an NBA coach; they train us, prepare us, but aren't suppose play. This is the dilemma the Church leadership in Western civilization faces. If they wish the Body of Christ to influence society then the leadership must fade to the background and focus on training the Body of Christ to do the work of the ministry. They must give up the reigns and trust the head of the Church, Jesus to do what he promised which was to complete the work that he started in us. This will be difficult. Just like Kobe Bryant, if they wish to start winning they will need reduce their minutes, if not completely. What that means and what it would look like we will explore at a later date. 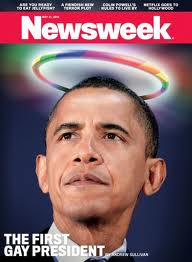 President Obama weighed into the current controversy surrounding gay marriage by announcing publicly that his belief system has 'evolved' and he now supports the rights of homosexuals to marry. I am not going to analyze the politics if what he did was a way to bolster his re-election prospects; what I want to discuss is what I think should be the Christian response to homosexual marriage and the act of homosexuality. Let's begin by saying right from the start so there is no misunderstanding that as a Christian (and one of those dreaded fundamentalists who actually reads and believes his Bible) what I am not talking about is all those horrid scary stories the media and antagonists of Christianity tell that lead people to believe Christians want to take all the homosexuals they can find, arrest them and string them up on poles or evict them to some Scandinavian country where they might be cold but at least they will be accepted. I attend a Church where we uphold the Biblical view that homosexuality is a sin (more on that on Part II) but homosexuals are openly welcome. I personally know several who have attended our Church for years so they must feel some level of love and acceptance. What I want to discuss is the first nagging question that needs to be answered that comes up frequently in my discussions with relatives, friends, and brothers and sisters in Christ. Should there even be a response to the question of homosexual marriage? I believe there should be and what I am going to say is probably not just going anger the homosexuality community but a lot of Christians as well. I don't say this superfluously. I am already getting flack about it on Facebook posts and in private and public conversations. But before I jump off that ledge lets start with the first question. It appears to me that the moral dilemma facing Christians is, cannot we just live and let live? In other words, if homosexuals want to get married then why not, for crying out loud, can we not just let them do so and lets just all get on with our lives? Who are we to instruct these people on how to live so long as they are not harming anyone else? It is a seductive argument and I have heard this philosophy used for everything from recreational drug use to sexual immorality to doctor assisted suicide and of course homosexual marriage. It sounds like a wonderful argument except for the one small problem that no one lives their life this way. And I mean no one. What people are really saying when they spout this ill conceived philosophy is all morality is relative and what is good for me doesn't concern you. There is no absolute right or wrong, right or wrong is dependent on what each individual decides for themselves. This would be wonderful except for the fact that people who are spouting this shallow nonsense will be the first to call the police if their car is stolen. What they really mean by saying this is they want to be able to do whatever they want to do and if anyone else thinks otherwise they can go to hell. In my nearly twenty five years of observing peoples behavior the ones clinging to this philosophy are usually the ones committing adultery, lying, cheating, stealing and doing all other forms of behavior that is hurting other people. But let's say we do find that one truly altruistic individual here on this Earth (and if you do find them, please introduce me immediately; I keep trying to claim this position but my wonderful wife keeps shooting me down off that pedestal) who can do whatever they want and not harm anyone there is still somebody that they are offending. God. And that is really what this is all about. Homosexuals in their activity and their desire to be married are not offending just society (all the polls and state votes on marriage amendments are pretty clear that a good majority of the American people are still against homosexual marriage) but they are offending the laws of God. He created marriage, not man, and this is not about defining the rights of homosexuals but is much more about man telling God that he can define marriage anyway he pleases thank you very much. If marriage is not about the Holy covenant between God, man and a woman then why can't it be between a mother and son? A father and daughter? Three men? Multiple men and women? A man and a boy? If marriage can be defined by society then it can be defined as anything man wants it to be and then it is an institution initiated and designed by men and not by God. This isn't a new conflict; it is as old as the dilemma in the Garden of Eden. We chose the knowledge of good and evil over life because we 'wanted to be like God'. And everyone can see how wonderful that has worked out. Yes, we need to response to the homosexual agenda to redefine marriage. But how can we do so in a loving manner and to what degree? Good questions, but before we explore that territory let's talk about the shocking and disturbing trend of homosexuals claiming to be Christians and the Church's refusal to speak out against sexual immorality. We will do so in Part II. *The views expressed in this article do not necessarily express the views of the Church I attend nor my Pastoral leadership.